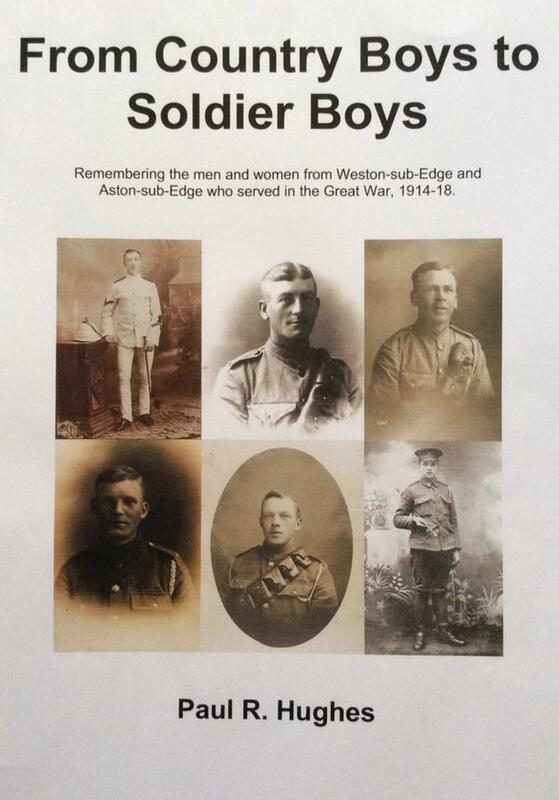 Remembering the 108 men and women from Weston-sub-Edge and Aston-sub-Edge who served in the Great War, 1914-18. Book Launch: “From Country Boys to Soldier Boys”On Friday 13th November Paul Hughes will be talking about his new book, “From Country Boys to Soldier Boys”, written in memory of the 108 men and women from Weston-sub-Edge and Aston-sub-Edge who served in the Great War, 1914-18.The launch will take place in Weston sub-Edge Village Hall at 7.00 p.m. This book, Paul’s second, was published in August 2015 and follows “Campden 1914-18” published in November 2008. This new book has over 220 photographs and includes short biographies of the 108 men and women who served from the two villages. It includes a section on Norton Hall VAD hospital and has a photographic gallery of new Chipping Campden 1914-18 photographs collected by the author following the publication of “Campden 1914-18” and also tells the stories of the various war memorials in the two villages. I have also set up a twitter account that will be dedicated to my 1914-18 trips and research for Chipping Campden 1914-18, Weston 1914-18, Aston 1914-18 and Queen Mary’s Grammar School, Walsall 1914-18.
great news to read you have started your second book Paul. Vol 1 is a classic and I feel proud to have family in it. Good luck and please let me know when you publish as I look forward to obtaining a copy.